Floral prints are on trend right now. I've seen them everywhere. From beautiful interiors, art, fashion. And yes, even on mundane everyday items like tissue paper. Lol! 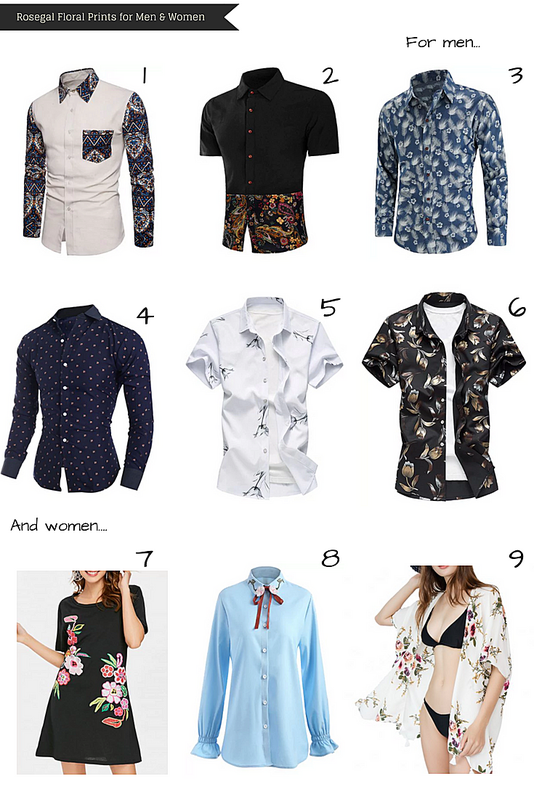 Below I've curated 9 fun floral print outfits for both men and women. All the clothing items mentioned below are from this website called Rosegal. They sell cheap, affordable fashion for all ages alike. Men's shirt#1 has that formal look to it. Wear it as is or with a blazer, coat or jacket. I find Men's shirt#2 to be unique. It has a very traditional/cultural feel to it. Men's shirt#3 has more feather prints to it than flowers, but I like that it has this denim look. If there's a shirt from the list I'd want my husband to wear to work, it would be men's shirt#4. It has teeny tiny details, almost non-flowery prints that's hard to notice. I know he'd be okay wearing that compared to the rest. Men's shirt#5 has simple style while men's shirt#6 is the opposite. Here's a tip, when making an order from them make sure to order 2 sizes up for men. I've made this mistake before. My husband is a size L. I've ordered an XL jacket from them last Christmas. But the zipper in front would not close. It's still on the small side even though it's an XL. I couldn't reiterate this enough but, you have to be really sure with his size before placing an order. For women, I've picked dress#7 because it's made of light material, great for indoors. Shirt#8 is a pretty office look for plus size women and pick#9 is a cute coverup to the pool/beach. For more choices, check out Rosegal's floral print shirts on the link provided.